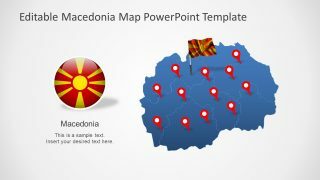 The Republic of Macedonia PowerPoint Map Template is an editable presentation for a business, marketing and learning purposes. 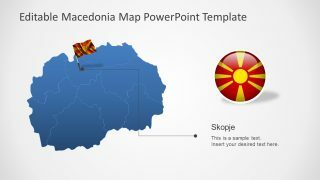 It is an outline map of the Former Yugoslav Republic of Macedonia or FYROM for short, a country in the Balkan Peninsula, Southeast Europe. 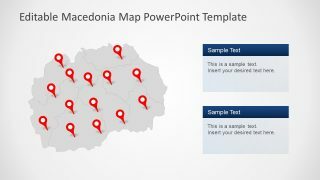 The 7 slides template of Macedonia enables users to either choose layouts or complete presentation. It can depend on the geographical details of their topic. 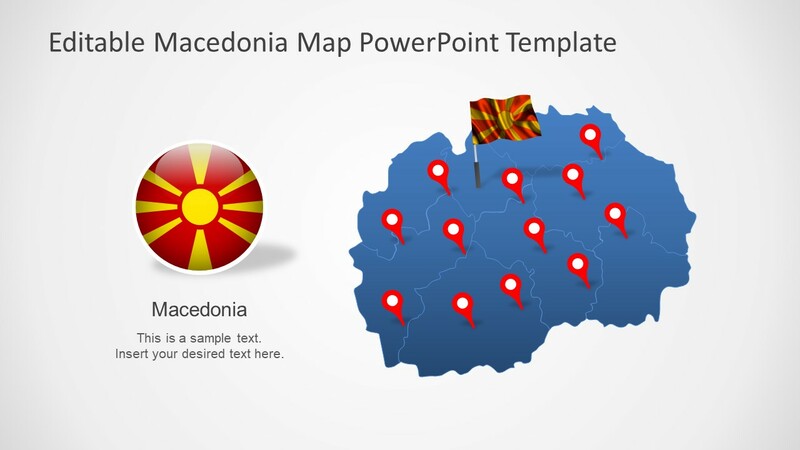 For example, if a presenter wants to give a regional overview of Macedonia, they can use few selective slides. And, utilize complete template for detailed presentation. 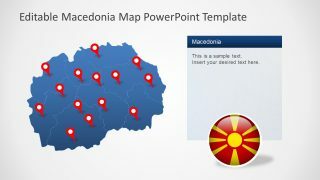 The PowerPoint Map template provides an outline of Macedonia’s administrative districts. 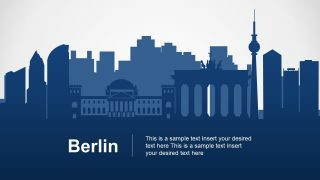 This template can present locations, headquarters, sales and marketing regions, traveling etc. Therefore, the slides of zoomed-region and highlighted cities can come handy while focusing of these areas. 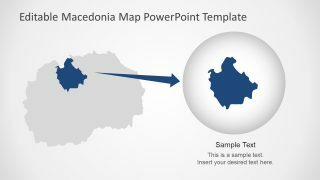 The Republic of Macedonia PowerPoint Map Template features detailed geographical layout as a division of regions. 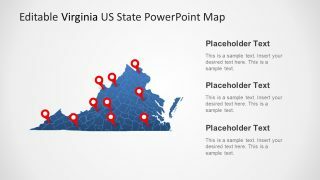 These divisions are flat PowerPoint shapes, join to create a county map. Further, the slides include various flag, pin markers, and other highlighting shapes. 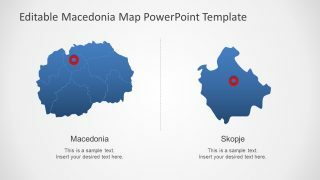 That’s why it is an editable PowerPoint map of Macedonia. 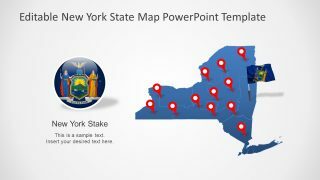 And, all the shapes and icons assist users to customize and personalize these map slides according to their presentation needs. For example, displaying a zoom-in view of any region as shown in slide 5 and 7. Or, add different colors to each administrative district which may help distinguish them while presenting their topic. Furthermore, PowerPoint provides sufficient text placeholders to enter textual details. 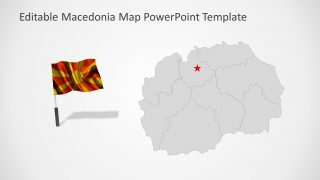 This template of the Republic of Macedonia map is suitable for business discussions, like global reach as a part of company profile. 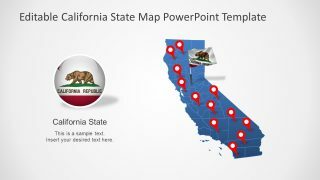 However, the teachers can use this PowerPoint map presentation as a learning activity tool. They can also insert photos of famous landscape and tourist spots. Or, explain population, ethnicity, and similar statistics for global analysis purposes.